The score card presented below is based on two models: Intensive Structural Therapy and Results Based Accountability (RBA). Mark Friedman worked in the Maryland Department of Children’s Mental Health for 18 years. He developed RBA after he became increasingly concerned that while many services were provided, there was little outcome orientation. Were the problems being resolved? Was anybody better off? In many ways the same is true of mental health services. There are many models and many practitioners, but do we clinicians systematically track to see that we are getting good outcomes? The IST Clinical Scorecard was developed by Charles Fishman and Mark Friedman as a tool for frontline clinicians to track their outcomes, regardless of the clinical model being used. Importantly, this tool also provides clinicians with a framework that helps diminish the ubiquitous fragmentation of services. - José Raul Capablanca, Cuban chess player who was world chess champion from 1921 to 1927. Considered of the greatest players of all time. Sub-goals can be stated to address specific aspects such as a “learning disabilities,” which would have different plans and often a longer periodicity to expect change. Or an objective such ceasing running away - the measurement would be a shorter periodicity. What the treatment team plans to do to ameliorate the presenting problems and achieve the pre-determined objectives. Plans can include a variety of things such as: family therapy, vocational counselling for parents, or an initiative to find additional family supports. Measures: central to RBA is measurement. 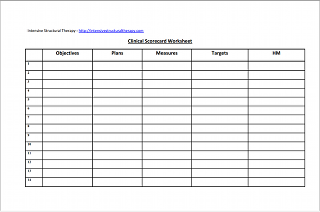 How achievement of objective(s), goals and progress are going to be monitored by the treatment team. Following on from the above example, we typically measure functioning using the CAFAS--which assesses levels of functioning in eight domains (school performance, thinking problems, self-harm, behaviour toward others, substance use, moods/emotions, home, community.) For our residential program, we use token economy points systems, grades, points on the Triangulation Scale or Single Parent Scale to measure family functioning. The measures selected by the treatment team must be relevant to the objective(s) outlined in the scorecard in order to be able to meaningfully track progress. They must also be quantifiable and be accessible and feasible given the treatment team’s resources, knowledge and skills. Specific measurable achievements bound by a realistic time period based on previous performance. Targets are typically expressed such as: “in x period of time we want to achieve an x percentage of improvement”. For example, a possible target could be a 10% improvement in CAFAS in one months’ time. Targets serve as bench marks and are often effective in helping the treatment team to focus and be more collaborative. Measurement of progress is crucial in order to determine whether targets have been met. The Homeostatic Maintainer is a pattern of functioning or an individual’s behaviour that prevents change and maintains the presenting problem. For example, a father that ignores his son’s antisocial behaviours, refusing to support consequences. (The concept of the HM is discussed in greater detail on this website.) The treatment team should outline the identified HM(s) as this can inform treatment and highlight areas of difficulties. While specifically based on Intensive Structural Therapy (IST), the HM can be understood to represent barriers to change, be it individuals or processes and is, therefore, not just applicable to IST.